Being an ambitious organization, FNSARM chosen as its first event an international championship with the intention to hold these competitions with strongest athletes at the highest level! The event was held in accordance with the highest standards, which dictates the time. Thanks to good organization, federation president, Marcel Darie, invited the General Secretary of the World Armwrestling Federation (WAF) Mircea Simionescu to visit the Cup, as well as Assistant Office of the Federation, and multi-national team of referees headed by the best referee of the European Championship in 2016 Catia Crucitti from Italy. 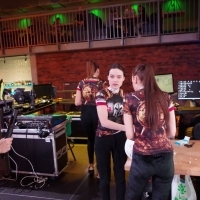 The venue of the championship was a theater studio "Gen Art", which provided the ideal conditions for athletes and for all the organizers who have been involved in the competitions. In the championship was attended by 103 athletes from Moldova, Romania, Ukraine, Bulgaria, Italy and Poland. For the four categories of men on the right and left hand were given prizes, girls competed in the Open category on both arms. The competition was attended by the winners and prize-winners of the national championships, European and World Championships as well as Professional World Cup. Spectators held their breath, watching the tense, tight and beautiful fights, after which the winners were Irina Rozheschenko (Ukraine), Daniel Procopciuk (Moldova) Viorel Dobrin (Romania), Yordan Tsonev (Bulgaria), Vadim Stetsuk (Ukraine), Sabin Badulescu (Romania). Championship ended with the definition of the absolute champion. In the left hand fights the vice-champion of the World Championship Yordan Tsonev (Bulgaria) dominated the best athlete Romania Sabin Badulescu won fights on the right hand. During the ceremony, all winners received money prizes. Worthy of attention to the work of the referee team at this tournament. During the competition, which was more than 700 matches, only a decision on the two of them were protested, one of which was rejected. Championship managed without injury. The athletes really enjoyed the event, many participants noted the good level of the organization, and thanks for the hospitality. Photos are here and here. Video: 1st table, 2nd table.